Here's an example persuasive speech on the topic of integrating energy medicine into mainstream medical institutions. This is a subject that I am passionate about, because I believe such an integration could truly make a difference in the world of health. When considering persuasive speech topics for your own presentation, focus on those that move you personally - your words will be so much more effective if spoken from the heart. P.E instructor and father of three Jason Hale's neck had been aching for months. After three surgeries, his pain had done little but worsen. The hardest part of the entire situation was now, on top of the daily pain he had to deal with from his physical problem, he had a Vicodin addiction to top it off. In an attempt to stop his downward spiral of pain and pills, Hale contacted a local acupuncturist. After just three sessions, he could experience entire days pain free. Four months into the treatments, Hale was pain and drug-free. A medical miracle? Most doctors and scientists would say "no". That's the reason Hale's doctors never informed him of the option of using energy medicine in the first place. Acupuncture is just one of the many treatments in the field of energy medicine that offers true healing results. As such, despite the critic's complaints, it should be integrated into mainstream medical institutions and offered to patients as a choice of healing therapies. Admittedly, the field of energy medicine is a confusing topic for many. Energy medicine encompasses so many areas, it can be hard to sort out fact from fiction. 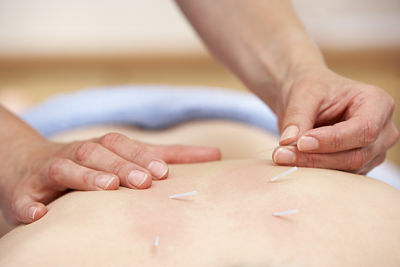 The term "energy medicine" includes a variety of different medical techniques, including acupuncture, yoga, reiki and massage. By applying pressure or directing energy through the hands to specific points on the body, it is possible for practitioners to change the flow of energy in the body, alleviating pain and preventing disease. It is indisputable that energy is the way in which the body functions; we need energy for everything from doing physical activities such as running, to digesting food, to even working on the cellular level to grow and copy our DNA. Energy medicine works by diagnosing and treating the blocked flow of energy within our bodies to create balance and well-being. Scientists and doctors in the Western world suggest that energy medicine is little more than a scam. One article went so far as to report that most called it "outrageous quackery." In fact, many warn that energy medicine is quite dangerous to those with serious medical conditions, as many choose these practices over more traditional medical procedures. A 1993 New England Journal of Medicine study, though, went against the medical establishment in suggesting that thousands use energy medicine successfully for chronic pain their doctors are simply unable to treat. The simple truth is that the use of energy medicine can help heal and protect the body. Giving patients a choice in mainstream medical institutes also gives them more ways of gaining a healthy lifestyle. It is important to note that energy medicine is never dangerous. Therefore, even if a technique doesn't work, the patient will be left in no worse health than when he or she started, which is not always the case with mainstream medical procedures. In view of this fact, there is really no reason to not give energy medicine a chance to help. While many suggest that energy medicine just doesn't work, the other major argument against including it in mainstream medical institutions is that it wastes money. The National Institute of Health created the National Center for Complementary and Alternative medicine in 1999 with a budget of $50 million dollars. Traditional doctors and scientists were outraged at the fact that the fifty million wasn't allocated to their own programs. Most seem to be against even studying its effects. This is, perhaps, because they are frightened by what preliminary studies show. Since 1966, over three hundred thousand studies have been completed to show the effectiveness of energy medicine. And, if nothing else, energy medicine critics should be silenced by the fact that it provides peace of mind and relieves stress for many patients. Studies have proven that positive thinking or a positive outlook on their disease can help a patient be more receptive to mainstream treatments, which in turn can help cure illness or prolong life. This effect alone is worth the money to help study it. Energy medicine should be a choice for patients, and mainstream doctors should research and accept the benefits of these practices. By allowing energy medicine to be integrated into mainstream medical institutes, we cannot hurt patients who are suffering, and it is very possible that we may help them. The important thing to remember is that by providing many forms of treatment in conjunction with one another, doctors can effectively save the lives of patients, or at least make them comfortable in their last days. Energy medicine is one such treatment method that should always be considered. So? What do you think? Did my example persuasive speech persuade you to consider that the medical mainstream should incorporate energy medicine into its programs? I hope it did! 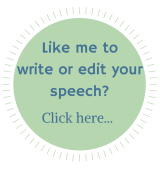 Now why not try writing your own example persuasive speech on a topic that excites you and see if you can persuade folks to take up whichever cause you are passionate about.